Wirepass to the Whitehouse Trailhead - Buckskin Gulch is an exceptionally long and spectacular slot canyon that lures hikers into the relatively new and adrenaline pumping pursuit of canyoneering. Touted as the "longest slot canyon in the world", Buckskin Gulch is twenty-one miles from start to finish. In reality however there are probably technical slot canyons like Kolob Canyon that are longer. The extreme narrow passage twists like a snake, opening up here and there, letting sunlight bake the canyon floor, before it again constricts and darkens. Head out for an overnight backpack, hike the complete route in a day or just partake in a peek and retreat from the Wire Pass Trailhead to the confluence of Buckskin Gulch. A permit is required, but to day hike, just obtain one at the trailhead. Overnight trips require a permit obtained either online or from the BLM office in Kanab, St. George or the Paria Contact Station. Day Hike: Yes, but usually done as a backpack. Distance: Complete route is 21 miles. The confluence of Wire Pass and Buckskin and back is 3.5 miles. Equipment: Water shoes, sun protective clothing, extra socks, emergency supplies including bivy gear, dry bags, water purification or filtration method, 50' of rope, harness and descent device. Difficulty: Strenuous. When the authors hiked this canyon last there was one obstacle that required 40'of rope to negotiate. Depending on the time of year and how wet the season has been, wading and swimming in very cold water might be necessary. .
Best Season: Early spring when it is not as hot, but this is a year-round. Vehicle Shuttle Setup for Wire Pass to Whitehouse Trailhead - Buckskin Gulch via Wire Pass to the Whitehouse Trailhead - From Kanab drive 44 miles east on Highway 89. A little less than a half-mile after crossing the Paria River, turn right, heading toward the BLM Paria River Contact Station. Follow this dirt road 2.25 miles to the Whitehouse Campground and parking area. Leave a vehicle and return to Highway 89. Drive 4.5 miles back toward Kanab, looking for the House Rock Valley Road turnoff. Turn and drive 8.5 miles to the Wire Pass Trailhead. Wire Pass - Walk east, across the road, and follow the "trail" to the register. The beaten path continues east, following the wash. Continue east, ignoring the sign directing hikers toward the "Wave." At 1.3 miles, sandstone walls enclose dramatically, then open up again as travel continues toward the confluence with Buckskin. Soon the canyon constricts enough for hikers to barely slip through before the confining stone opens once again, exposing the sky above. At the confluence with Buckskin Gulch (1.75 miles) you will want to look for the Wire Pass petroglyphs at the base of the large alcove on the right. 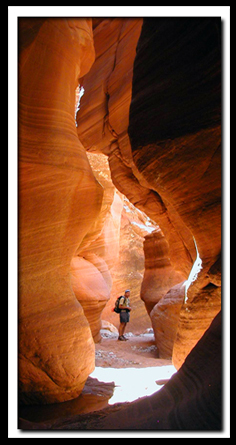 Buckskin Gulch - As you enter Buckskin, dramatic lighting haunts the slender crevice of the twisted wind and water-carved slot canyon, allowing spectacular photography during the next 12 miles. Almost 8 miles from the start of the hike and a bit over 6 miles into Buckskin Gulch, there is an escape on the left side (north) known as the Middle Trail. Walk up the steep, sandy ramp a short distance to see two sheep drawings etched on a small panel. Return to the canyon floor where 50' down canyon you should see weathered petroglyphs on the left wall. Walk 100' downstream from the exit, and then look upstream and 100' vertically above the faded petroglyphs to see a single human figure deeply etched into the darker stone. Around the corner, to the left are several more drawings. This is a good place to turn around and return to the Wire Pass Trailhead if you do not plan on hiking through to the Whitehouse Trailhead. Beyond this point there is a major obstacle and, depending on the current condition of the canyon, you may be required to wade or swim. If you are doing the through hike, continue down canyon where roughly 4 miles from the Middle Trail a large group of boulders make a formidable obstacle. To the left side is a 20' vertical drop, and "moki steps" carved into the rock. In the middle of the boulder pile is a 15'down-climb, where a rope can be threaded as a handline or rappel line. Remember that floods have formed this canyon and the nature of the canyon can change quickly and dramatically. Be prepared for circumstances not described. About a mile past the obstacle , water usually seeps from the canyon floor where you can refill water bottles, however don't count on the water always being there. Just before reaching the river you will see campsites above the flood plain, on both the left and right sides of the somewhat open wash. If you are spending the night, this is where you will make camp. Exit - The Paria River enters from the left. Once there, turn upstream (left) at which point it is 7 miles to the Whitehouse Trailhead and your awaiting vehicle. Tall sandstone cliffs line the path and a towering arch is dead ahead. The farther north you travel, the wider the canyon walls become until they finally disappear. Soft sand at the end of this route makes it difficult to hike this route in one day. This should only be done by those in excellent condition. This slot canyon is usually considered to be the worlds longest slot canyon, however some technical slot canyons like Kolob Canyon are probably longer. Day hikers can obtain a permit at the trailhead so they can just show up and hike on any given day. This makes this a great option for anyone that enjoys a long day hike. Flash flooding is a very real danger in this canyon. Contact the BLM for weather and canyon conditions before attempting this route. Lodging and services are available on the gorgeous east side of Zion National Park, where guests are close to Zion National Park (12 miles), Bryce Canyon National Park (60 miles), Cedar Breaks National Monument (45 miles), Coral Pink Sand Dunes (12 miles), and the North Rim of the Grand Canyon (85 miles). It's where city traffic is absent and the skies are bright and clean. It's 10-miles to the Stateline Campground from US Highway 89. There are only 4 spots, so if you want to camp get a spot early. It's first come first use. Two of the camp sights are in Utah and two are in Arizona. There is no water, but there are vault toilets. Kanab Office: 318 N 100 E Kanab, Utah 84741 435.644.4600.
between Kanab and Page, Arizona. Paria Canyon Wilderness contains Coyote Buttes Special Management Area which was made popular by the Wave. The sandstone buttes sit at the bottom of Utah's Grand Staircase-Escalante National Monument and the upper section of Arizona's Paria Canyon Wilderness. 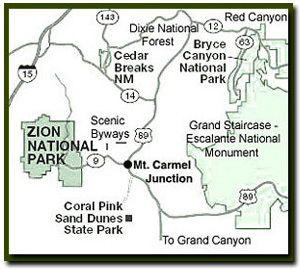 Stay in the heart of the parks, Mount Carmel Junction, and visit the treasures of the Southwest and Utah. It's a better site than the NPS's anyway."